On the way home yesterday, the Necro-Pug started giving me some weird feedback through the drivetrain (it’s fixed, so it does that). 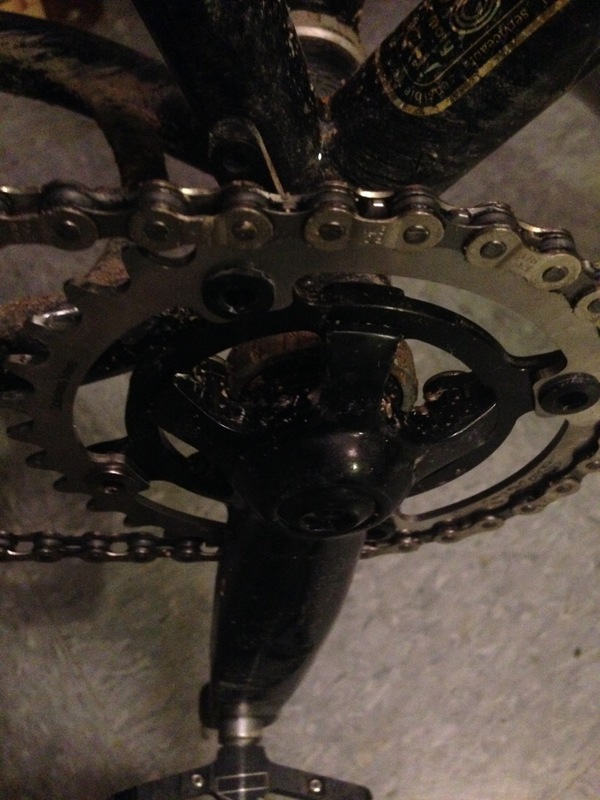 At first, I figured that perhaps the hub had slipped a little and the drivetrain was no longer perfectly straight. Upon further examination, I found that the rear wheel was perfectly positioned–but the chainring was shifting back and forth whenever I put any substantial pressure on it in either direction. I nursed it home and then brought it into the shop this morning for a closer look. The problem? Three of the four bolts where loose and the ring was essentially rotating slightly back and forth around the fourth bolt. Which begs the question: how did that happen? I’m pretty sure that none of the work I had done on it (brake installation, etc.) last week would have necessitated any kind of work with the chainring and crankset. Either way, it’s all snug and tight now and ready for more crawling through the snow. Too bad it’s all melting in the above-freezing temperatures and light rain.